If you build it they will come, or that’s what they tell me. Makes me wonder if the Dungeons and Dragons characters ever made it to that fort I built when I was 12 … but I digress. What I am getting at here is about Burgers and Beers. 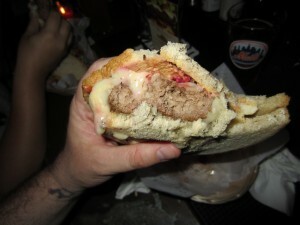 There are hundreds of thousands of people that know me because of this blog and or my bar in NYC, Idle Hands. Both of which started as passion projects and were meant for me to be able share what I love with the rest of the world. 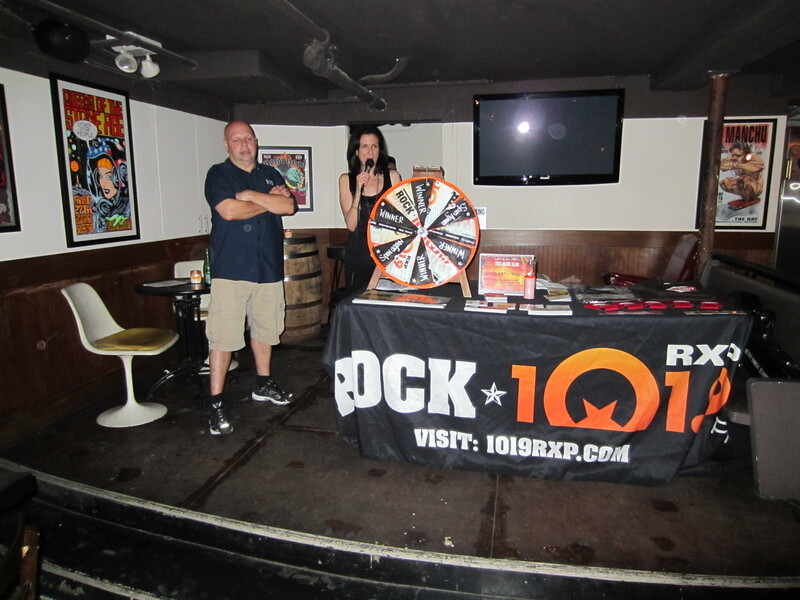 Recently Rock 101.9 RXP FM, our local rock and roll radio station reached out to Idle Hands and our upstairs neighbor Billy Hurricane’s and asked if we wanted to participate in a Burger event. 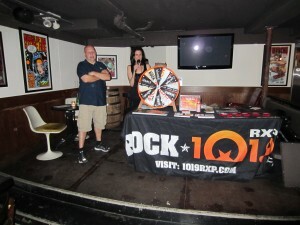 Forget the fact that they are a huge media outlet that has potentially millions of listeners playing pretty much a lot of the same music we play at the bar. 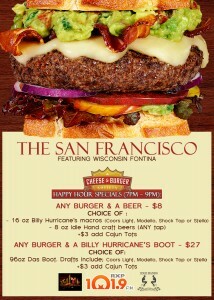 OF COURSE WE WANT TO DO A BURGER EVENT AT THE BAR! 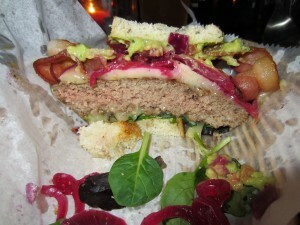 I didn’t start this blog or open up a bar to turn down Burgers and Beers!!! While I added in the link-outs, you can plainly understand why there was no way this Burger obsessed, Beer loving, media ham, bar owner (also, intelligent, witty, charming and successful) was going to say no! 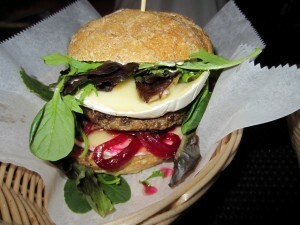 First and foremost, I love the Cheese and Burger society and have been reading their site and posts for sometime now. 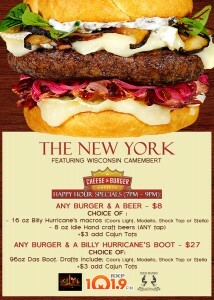 I love that Wisconsin Cheese decided to choose Burgers as the platform to promote their delicious product. Seems like a no brainer doesn’t it, but then why aren’t all the other cheese society’s doing it I ask you!?! 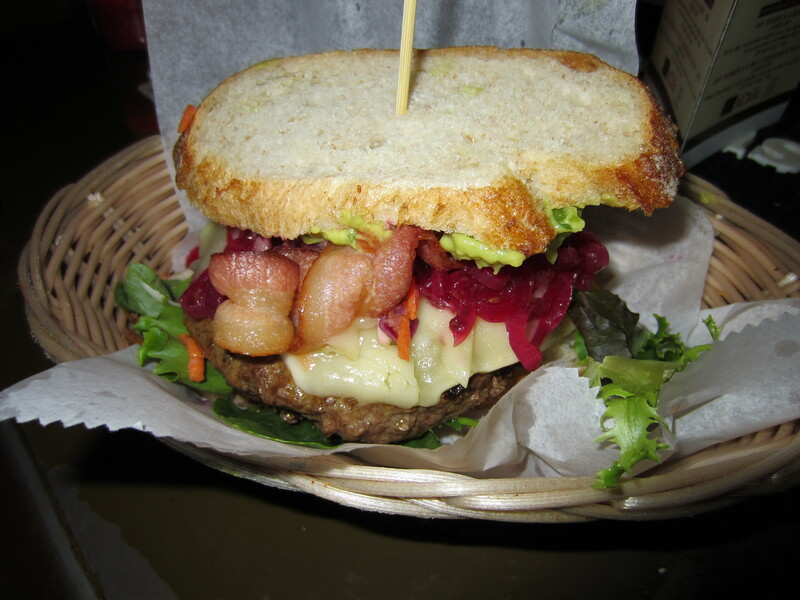 The ideas was that while the Cheese and Burger Society were promoting their 30 Burgers on their “Cheeseburgers Across America” promotion, they would stop at Idle Hands and Billy Hurricane’s in NYC. It’s not like they needed to send us the menu of Burgers to convince us but once they did. it was even more obvious that we had to say yes. Hungry? So were the gads of people who showed up to get on the Wisconsin Cheeseburgers Across America train as it stopped into Idle Hands and Billy Hurricane;s for dinner and beers. While I truly wanted to gnaw into all 3, I buckled down on just one. In trying to stick with the theme, I placed an order for a Wisconsin that was washed down by a tall and tasty glass of Boulder Beer’s Sweaty Betty. I could’ve done with out the Red Cabbage Slaw, but that’s only because I’m just not a fan. The rest of the sandwich though..oh yeah!!! Two kinds of Onions, creamy Mustard, a thick and juicy fresh Beef patty and a piece of Wisconsin Brick from Widmer’s cut so big that it resembled it’s name. 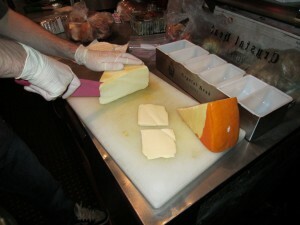 Brick is a mild cheese that gains in flavor as it ages and melts only to a very thick cream like state. It’s just a little smoky and almost peppery, kind of like Brie but with it’s own distinct taste. FYI – Brick cheese is called that because the Cheese Curds are pressed with clay-fired bricks. Sounds tasty right? IT WAS! 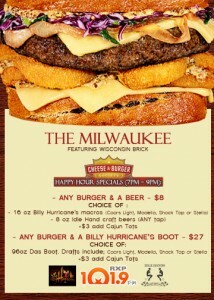 Thanks to the kitchen skills of Chef Wolfgang & Kyle from Billy Hurricane’s we were able to pull it off. A whopping “you freaking rock” to Millicent, Matt, Leslie and everyone else from WRXP who helped us to have a super fun and delicious party. Props to Marc who made sure everyone’s glasses were full of Bourbon & Beer while waiting for their Wisconsin Cheeseburgers. 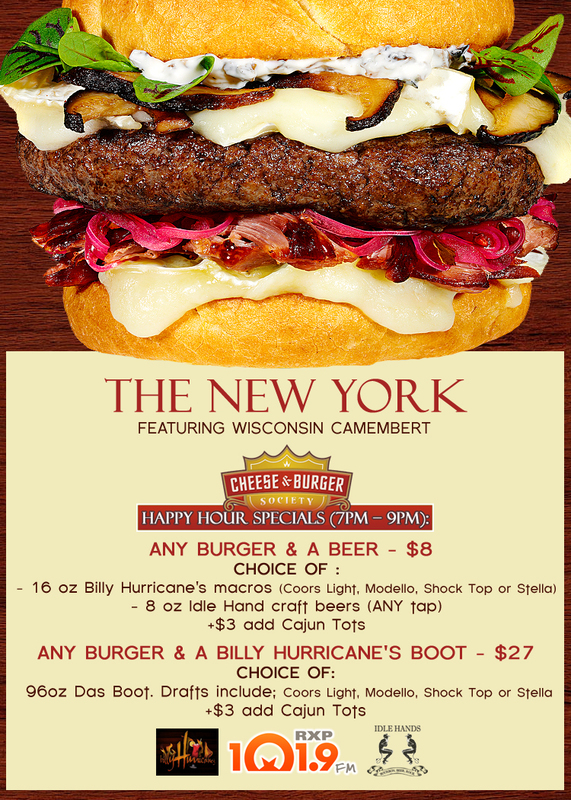 Last but not least, a mighty HOWYADOIN New Yorker’s welcome to Wisconsin Cheese for letting us serve you their amazing Cheese and Burger creations. A huge crowd of hungry people showed up to get their paws on these cheese blessed Burgers and they were not let down! This entry was posted in Bar, Beer, Best Burger in New York, Burgers, Event, Gourmet Burgers, Hamburgers, New York and tagged 101.9, america, billy hurricane's, burger, cheese, cheese and burger, cheese and burger and society, ciancio, conquest, FM, french, fries, great, hamburger, Idle Hands, leslie fram, milwaukee, new york, ny, nyc, rev, review, rxp, san francisco, the, the rev meter for social community, wisconsin, wrxp. Bookmark the permalink.